The property is located in the pretty village of Fontes da Matosa just 10 minutes from the resort of Armacao de Pera and 3 minutes from the newly built Amendoeira golf complex. The main house has two bedrooms, one double with en suite and one family bedroom that can sleep up to 4 people with a separate bathroom. There is also a large lounge diner and separate kitchen area that leads to an adjoining sun terrace with splendid views over the pool and gardens. A further two bedrooms are situated in a self-contained annexe with kitchen, lounge and wet room. Both have air-conditioning, central heating and SKY / satellite TV. Below there is a basement/garage that houses a utility room with washing machine and dryer, etc. Outside is an 11* 5 m heated pool with separate shower, a jacuzzi and large well tended gardens. Garden & pool area: •	Well-maintained gardens incorporating plenty of areas for relaxing. •	Sun loungers, chairs and tables. •	An orchard with oranges, lemons, peaches and figs, guests are welcome to enjoy these fruits. •	A gardener tends to the garden on a bi weekly basis. •	The pool measuring 11x5 is 1.2 in the shallow end and 1.8 in the deep end is maintained weekly. •	Pool leisure toys are available for use. •	A Jacuzzi is available on request refer to terms and conditions with regard usage. Maps and local information will be left at villa to assist you with finding local amenities. service numbers will also be on a board i.e. Hospitals Doctors Police Firebrigade. Towels provided. Hair dryers in all bedrooms. WiFi Internet access point. air conditioning, central heating , wood burner, SKY TV, music centre.filtered water. Various books. Games. Pool leisure toys. Fruit juicer. Jacuzzi see terms and conditions. Extra fridge freezer in utility room. Iron and ironing board in utility room along with the washing machines and dryers. Our stay in Portugal was fantastic.Our villa was out of this world it had everything you could possably need, the pool was fantastic. The villa and annex were so comfortable and immaculate. Paul was very helpfull lots of information and directions.We hired a car and seen a lot of different places we went to Lisbon which was great. All the family had a great time.Thank You Paul hopefully we will book for next year. This villa was beyond our expectations. Nice, clean, and perfect for us. It is well equipped. There was a range of inflatables for the children to use the in the pool. They had a cot and high chair for our 1yr old son. The pool was child proof, so there was no way any child was going into the pool without an adult unlocking the gates. Lots of land space to walk around and play football. Trees with lovely fruits to eat from. Lots of toys for the children and board games for all ages. Even a lovely Jacuzzi for the adults. Paul the owner is absolutely amazing, if we needed anything always happy to help. Plenty of socialising space withing the premises. I will definitely recommend this place to anyone. 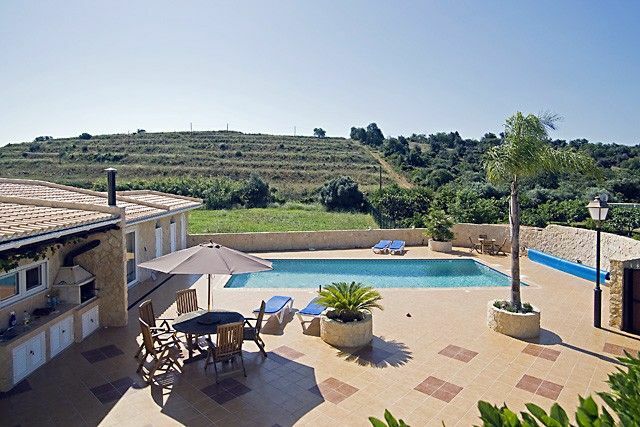 If I travel to Portugal again, will definitely stay at this lovely villa. Our aim is to give you a Comfortable and Relaxing place to Stay . Glad that you Enjoyed the Villa . Had an amazing holiday here with my extended family. plenty space for everyone and the added bonus was the annex which meant some of us could have our own space. The property was very well equiped with everything you need for a relaxing holiday. Paul and his wife have thought of everything from books, games chidrens toys and plenty of pool toys. They also have use of a cot highchair buggy carseat etc so no need to bring everything with you. Only 5-10 mins travel to restaurants and supermarkets and about 20 mins to Albufeira. Also about same to zoomarine. All in all a fabulous place would definitely book again. Just returned from an amazing stay here. It was the first holiday with our little girl who loved it too. Everything you could need for a family holiday. Hubby usually vows not to return to the same place twice for a holiday but we are already looking at booking this for next year. We spent 8 days at Casa de Rosa late September 2012 we just got back yesterday. We had the holiday of a lifetime with our extended family. 6 adults and 4 x 2year olds and one baby. It was just brilliant.The location is beautiful, rustic and tranquil but close enought to the beaches, shops, bars etc. The Villa is beautiful and spacious. The grounds fantastic from the pool, hottub, bbq facilities, amazing orchard. We enjoyed the villa and its faclilites so much we only ventured out a few times as the kids always wanted back to the villa. There are also a few little walks in the area including a dander into the picture postcase vilage of Fonte da Matosa. Thanks also to Paul and Betty who put in a fantastic fence around the pool to make it supersafe for the kids and also let the adults have their fun too. I would highly recommend the villa to anyone if you go once you will definately want to go back. PS The pictures do not do it justice it is even more beautiful! Fab house with more than your needs.everything has been thought of to make your stay enjoyable. Pool and hot tub are gorgeous. Outdoor BBQ is great too. 20 mins drive to nightlife/restaurants and shops. Situated in the Algarve area of Portugal and only one mile from one of the regions latest golf experiences, Amendoeira Golf Resort boasts 2 superb golf courses and other top class sporting amenities. The historic town of Silves, with its thriving markets is only 10 minutes away and the lovely town of Monchique nestled in the mountains is less than an hour away with beautiful scenic views. 10 minutes drive in the other direction is the charming coastal town of Armacao de Pera with its bars, restaurants and long sandy beaches. Also nearby is the port of Portimao with its renowned fish restaurants and marina where numerous boat trips are available. For the children you have Aqualand Water Park situated only 3 minutes from the Villa and also Zoo Marine an experience not to be missed. Not forgetting the ladies the Algarve Shopping Mall in only 15 minutes away by car. Restaurants serving locally sourced produce are within 5 minutes of the villa. Golf: Amendoeira Golf Resort opened in 2009 is a natural paradise near the ancient Algarve capital of Silves, a region steeped in history and just 1 mile from the Villa. Set in an area of outstanding beauty with the glorious backdrop of the Monchique Mountains the resort has two championship golf courses, Oceanico Faldo and Oceanico O’Connor. Sensitively integrated into the landscape the 2 golf courses have been designed as a perfect compliment to it, including unique features reflecting the history and culture of the area. There is also a Golf Academy boasting superb practice facilities at which individual or group tuition can be pre booked. The Amendoeira Golf Resort promises a fascinating golfing experience, perfectly attuned to this superb natural environment. The Amendoeira sports club also caters for football, rugby, crown and flat green bowling, tennis and cricket.